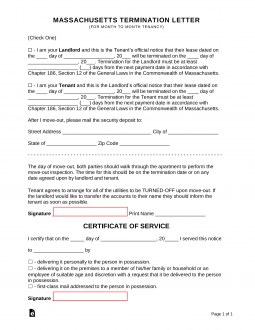 The Massachusetts Termination Lease Letter Form is a readily available template which Massachusetts residents may use to satisfy the notice requirement when terminating a Month-to-Month Tenancy. Here, when either Landlord or Tenant wish to terminate an At-Will rental agreement, he or she must issue a notice of this intent, making sure the recipient has read it a full thirty days before the desired termination date. It is worth noting when delivering this notice, one must also follow any instructions within the lease being terminated (so long as any outlined procedure is legal). Therefore, both Landlords and Tenants are encouraged to review the agreement they have signed before sending this notice. If no delivery procedures are outlined, it is highly recommended to deliver this notice utilizing a method provable in a court of law (i.e. certified mail requiring a signature). As a general rule, leaving such an arrangement amicably remains a preferable choice than otherwise. Providing this consideration as soon as possible will aid the recipient of this notice in finding a replacement without experiencing needless financial hardship. Typically, such considerations are as appreciated as they are required.